The NAPNAP Foundation is pleased to offer you this unique opportunity to acknowledge your long-standing commitment to children's health and our profession while supporting the Foundation which provides members with scholarships, research grants and other special programs. 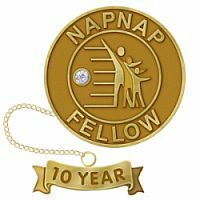 Purchase a NAPNAP Fellow pin and wear it with pride at your practice, university, hospital, chapter meetings and special events like annual conference. With every pin that is purchased, a donation is made to the NAPNAP Foundation to continue to provide opportunities for members to learn and grow. The NAPNAP Fellow pin is handcrafted and available in Gold-Plate, Single Gold-Filled, 10K Yellow and 14K Yellow Gold. There is also an option to add a 1.5pt Genuine Diamond to your pin. Five, Ten, Fifteen, Twenty, Twenty-Five, and Thirty Year Guards are available in various metals. Please allow 3-4 weeks for your hand-crafted NAPNAP Fellow pin to be manufactured. Engraving: Personalize your pin by having your initials engraved on the back of the pin. Engraving is included in the pin price and includes three initials and the year. Example: JLD 2014. Please enter three initials and year in the boxes provided.